Looking south from the Hotel Green, the cycleway was between Raymond on the left and Fair Oaks on the right. The toll booth is in the center of the photograph. It was a bold idea that seemed so visionary and yet so practical when West Pasadena resident Horace Dobbins first proposed it in 1897. “The wonder begins to be felt why somebody didn’t think of such a project before” observed “Land of Sunshine” magazine in 1899. America was in the midst of bicycle craze in the 1890s, and roads between Pasadena and Los Angeles were poor. 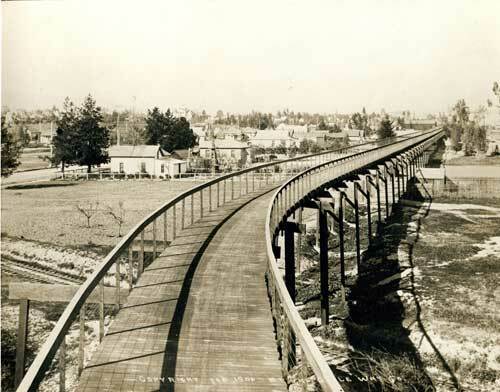 Dobbins envisioned an elevated bicycle highway, or cycleway, from the Hotel Green to the Plaza in downtown Los Angeles, nine miles away. 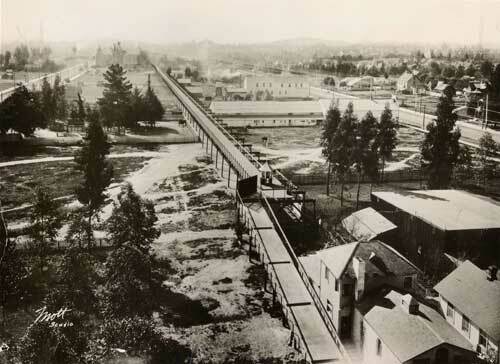 A view looking north from the southern terminus near Glenarm Street, showing the curve at the end of the ride. The cycleway crossing over Bellevue, next to the Pasadena Grand Opera House. 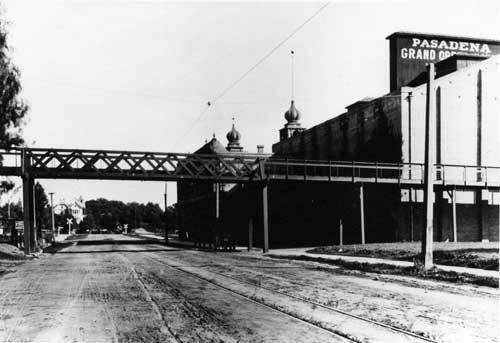 The first section was opened to the public on January 1, 1900. Beginning at Dayton Street, just south of the Green Hotel, the cycleway extended one and one quarter miles south to the base of Raymond Hill, near Glenarm Street. It was about 20 feet above an alley that was midway between Fair Oaks and Raymond. For a brief time, that stretch of the cycleway seemed to hold the promise of an exciting hour long ride to Los Angeles, and the possibility of a new era of transportation in Southern California. But in two years, the city of Pasadena needed to clear the land for what is now Central Park, and that section of the cycleway came down. Some time later, the rest followed. This article was originally published in the Spring 2013 issue of West Pasadena Residents' Association's The News.